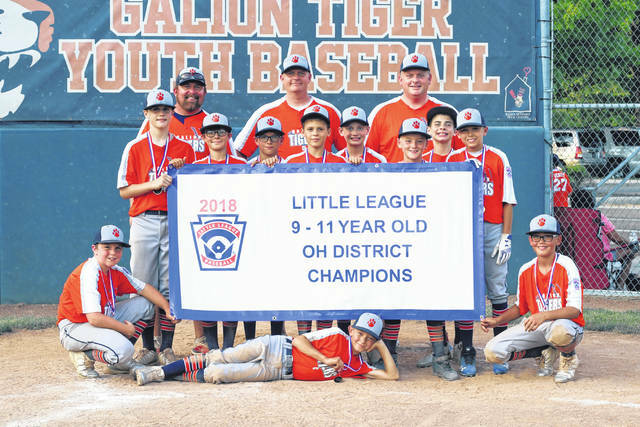 Erin Miller | Galion Inquirer The Galion 11U All Star team won the District 7 title last Saturday at Heise Park defeating Bellevue in two games, 21-0 and 15-0. Pictured are (front) Jimmy Hardy, Arius Swaim, Braxton Prosser; (standing) Carter Walters, Max Albert, Quinn Miller, Carson Campbell, Johnathan Maran, Landyn Prosser, Jacob Chambers. Coaches Tom Swaim, Ryan Albert and Sean Walters. The team will now head to the Ohio Little League State Tournament in Ironton with games beginning on July 28. GALION — The Galion 11U All Star team won the District 7 title last Saturday at Heise Park defeating Bellevue in two games, 21-0 and 15-0. Pictured are (front) Jimmy Hardy, Arius Swaim, Braxton Prosser; (standing) Carter Walters, Max Albert, Quinn Miller, Carson Campbell, Johnathan Maran, Landyn Prosser, Jacob Chambers. Coaches Tom Swaim, Ryan Albert and Sean Walters. The team will now head to the Ohio Little League State Tournament in Ironton with games beginning on July 28.
https://www.galioninquirer.com/wp-content/uploads/sites/38/2018/07/web1_IMG_7076.jpgErin Miller | Galion Inquirer The Galion 11U All Star team won the District 7 title last Saturday at Heise Park defeating Bellevue in two games, 21-0 and 15-0. Pictured are (front) Jimmy Hardy, Arius Swaim, Braxton Prosser; (standing) Carter Walters, Max Albert, Quinn Miller, Carson Campbell, Johnathan Maran, Landyn Prosser, Jacob Chambers. Coaches Tom Swaim, Ryan Albert and Sean Walters. The team will now head to the Ohio Little League State Tournament in Ironton with games beginning on July 28.